8MM Width, perfect choice for both man and woman of all ages. 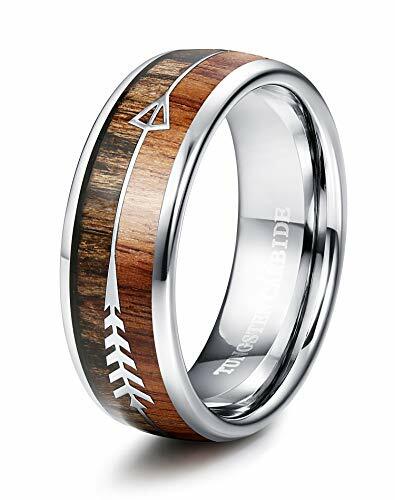 Perfect 8MM Wood Steel Arrow Inlay Tungsten Wedding Bands; High Polished Smooth Inner Face; Bring Better Comfortable Wearing Experience; Make You Feel More Elegance; Suitable for Both Men and Women. Made of Solid and Durable Tungsten Carbide; Scratch Resistant; Nice Weight; Perfect for Daily Wear and Great Gift for Wedding, Engagement, Anniversary, and Any Special Occasions. Idea Wedding Band,Engagement Ring or Promise Ring for Men and Women; Handmade with Exquite Craftsmanship; One By One Checking; We Focus on Every Process of the Product, in Order to Provide the Best Product for you. Comes in A Black Velvet Bag; Convenience to Store and Don't Worry about Lost your Ring.